The camshaft is a part of the piston engine. Diron parts sale high quality replace forged camshaft which used for heavy equipment like cat, cummins and komatsu . The camshaft is to control the opening and closing operation of the valve. The material is generally special cast iron, and occasionally it is also forging which is forged camshaft. Because the valve movement law relates to the power and operation characteristics of an engine, the design of camshaft occupies a very important position in the engine design process. The main body of the camshaft is a cylindrical rod with the same length as the cylinder block. 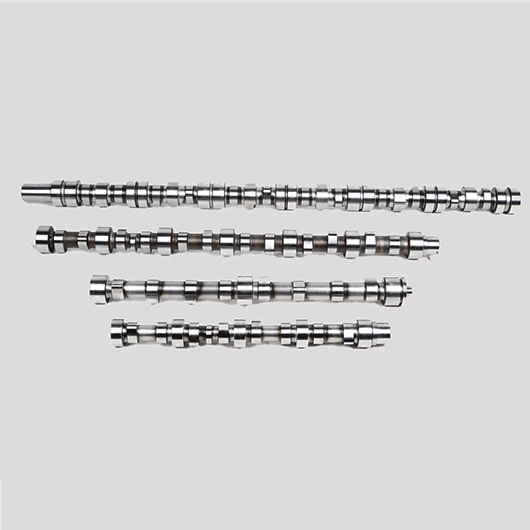 It is the aftermarket camshaft suit for cat machines parts. There are a number of cams that are used to drive the valve. One end of the camshaft is the bearing support point and the other end is connected to the drive wheel. The sides of the cam are egg-shaped. The purpose of the design is to ensure adequate intake and exhaust of the cylinder. According to the number of camshafts, it can be divided into single overhead camshaft (SOHC) and double overhead camshaft (DOHC). Single overhead camshaft is only one camshaft, while double overhead camshaft is two camshafts. Single overhead camshaft with a camshaft on the cylinder head, directly drive into the exhaust valve. It has a simple structure and suits for high-speed engine. The overhead double camshaft is mounted on the cylinder head with two camshafts. One for driving the intake valve and the other for driving the exhaust valve. The use of double overhead camshaft is not high requirement for camshaft and valve spring design. It is especially suitable for the valve V-shaped configuration of the hemispherical combustion chamber, and it is also easy to use with the four-valve valve mechanism.